In the wake of these past few weeks’ Brett Kavanaugh shenanigans, and as we draw nearer and nearer to the upcoming midterm elections, many people are reflecting upon the incredibly divided state of our nation in these times. With senators vowing to campaign against each other, both sides decrying the behavior of their colleagues on the other side of the aisle, and vote after vote going basically along party lines, the Senate has been a striking representation of the cultural and political binary in which we Americans find ourselves right now. Perhaps this is because I have been watching and reading a lot about the recent Russian interference in our elections, but William Blake’s poem ‘A Poison Tree’ seems eerily like Vladimir Putin’s playbook as of late. Fed by his resentment and grief over the fall of the USSR and a desire for vengeance upon Hillary Clinton, the Russians have watered us with fears and sunned us with deceitful wiles (fake news), causing us to do possible irreparable harm to ourselves, as well as to the rest of the world. Something that concerns me more, though, is that this also strikes me as disturbingly similar to the Republican playbook, as well. Republicans and our president have risen to power by employing and bank-rolling firms like Cambridge Analytica to manipulate the electorate by stoking fears and spreading disinformation. All the while, they continue sun their base with smiles and more deceitful wiles: they promise to take care of the plight of these primarily white, blue-collar workers, yet all the while they pursue economic agendas that will only hurt the lower and middle-classes, all the while cutting taxes for the richest of the rich (which it seems will only result in doubling the national deficit) and doing their best to eradicate the social services that provide affordable care to these very people for whom they are promising to advocate. The Republican obsession with poisoning the well of facts and reality seems to know no bounds. It even extends to the subject of climate change: our world’s leading scientists in the field have been admonishing us for decades about the dangers posed to humanity (and all life on earth) by human-made climate change. Yet even in the wake of this past week’s terrifying warnings of impending disaster, politicians still seek to sow seeds of doubt and disinformation, despite the fact that the fate of humanity and the world as we know it seem to hang in the balance. Not even the news of our own impending apocalypse can bring people together. On the Democratic side of things, there is a disturbing sense of the moral high ground, as well. I have conversation after conversation with liberally-minded, progressive Democrat friends, who are equally angry. Their disdain of Trump voters and the level of their anger disturbs me. Rather than try and find some common ground and figure out a way to empathize with the 46.1% of America who voted for Trump, many look down on these fellow Americans as evil, hate-filled, stupid deplorables, all the while preaching tolerance and hash-tagging righteous causes at the drop of a hat. This binary trend of two sides shouting at each other and an increasingly divided United States is something that has been steadily developing steadily since the 2008 election, and it is understandable that there is a lot of anger amongst us. The world has changed dramatically over the past couple of decades, at a bewildering pace. And for a variety of reasons, we are facing a cultural and political reckoning of decades upon decades of a gross imbalance of power right now – between the genders, between races, between the rich and the poor, between the straight and LGBTQ communities…the list of downtrodden minorities goes on. It’s also understandable that we feel fear right now: our democratic norms are turned upside-down on their head, and many recently hard-won rights that are vital to the success of our experiment in democracy seem to be legitimately endangered. In ‘A Poison Tree’, Blake makes one key distinction that I find so relevant to our times right now: when one is angry with one’s friend, one expresses that feeling so that it can be let go. When anger is stifled and used to stoke fears, it becomes a poison to be used to vanquish an enemy. Underneath all the mess of things about which to be concerned every time a news alert goes off on my phone these days, the thing that bothers me most deeply about the current state of affairs in our divided United States is that we seem to be very confused about who are our foes and who are our friends. Rather than trying to have a conversation about healing this ever-widening rift, we seem to be more concerned about one side vanquishing the other. At the end of the day, Democrat or Republican, aren’t we all Americans? Whether we live in China, Russia, the United Kingdom, South Africa or Brasil, aren’t we all human citizens of the planet Earth? Why is it that we are so eager to consume the poison that the Russians are feeding us? Not only that, why are we poisoning ourselves? We actually now are keenly aware that they are doing this. So why is it that we continue to sip at this poisoned cup? This Vaughan Williams project is part of a larger recording project that is fiscally sponsored by Fractured Atlas and was made possible in part by a generous grant from San Francisco Friends of Chamber Music / Intermusic SF. NOTE: This is the first in a series of posts about Vaughan Williams' Ten Blake Songs for tenor and oboe that I will be writing over the coming weeks. Since my first encounters with Britten's Winter Words, I have been inundated with British composers' and poets' fascination with youth and innocence, and the imminent and inevitable threat that life inherently poses to both. Innocence versus experience - it's a dichotomy that humankind has wrestled with for eons. It's one of the predominant themes in Britten's work (not just in his Winter Words, but countless other works, as well), and I have been drawn to ruminating on it in depth for much of my professional life over the past decade or so. As a result of this fascination with the subject, I've been wanting to explore Vaughan Williams' Ten Blake Songs for tenor and oboe recently. 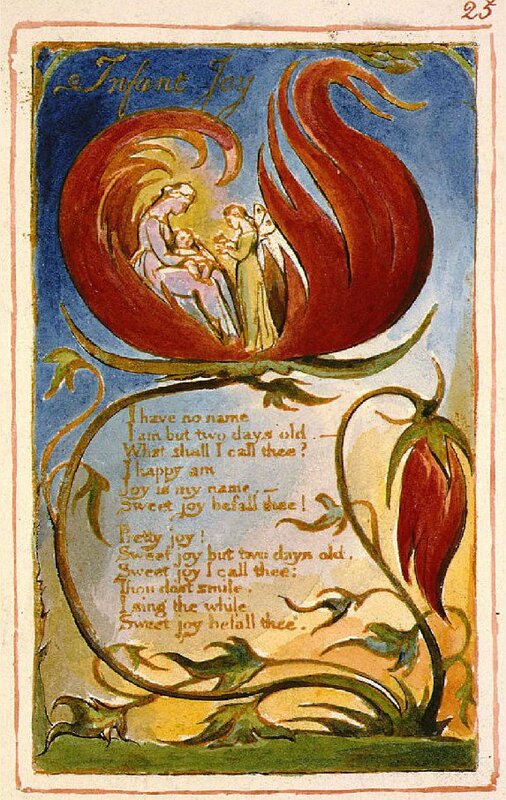 Almost all of the songs in Vaughan Williams' piece are settings of Blake's Songs of Innocence and of Experience, and I can think of no other piece of literature which engages with the subject more directly. On the one hand, the concept of naïveté's preciousness is a challenging one for me. Growing up as the child of scientists, there was nothing worse in my family than not knowing. Combined with the earnest (and ironically slightly naïve) ethos of tthe internet age (let us make all knowledge and experience accessible to all), which has led to everyone suddenly becoming an expert on everything, this feeling that I need to know all the things or to have experienced everything has only been reinforced. On the other hand, as an artist, there is nothing worse than knowing. The greatest artists I know and have the privilege of working with are the ones who never lose their sense of wonder at the world. It's almost as if they are in a perpetual state of discovery of the beauty and awesomeness that surrounds them. Without this sense of wonder, we lose the ability to create our art, and to draw our audience's attention to these beautiful things that can be so easy to take for granted. It is through this lens that I have mostly related to this idea, although there have been other moments of understanding along the way. "...By the time I identified as being gay, it was too late. I was already homophobic, and you do not get to just flick a switch on that. No, what you do is you internalize that homophobia and you learn to hate yourself. Hate yourself to the core. I sat soaking in shame… in the closet, for ten years. Because the closet can only stop you from being seen. It is not shame-proof. When you soak a child in shame, they cannot develop the neurological pathways that carry thought… you know, carry thoughts of self-worth. They can’t do that. Self-hatred is only ever a seed planted from outside in. But when you do that to a child, it becomes a weed so thick, and it grows so fast, the child doesn’t know any different. It becomes… as natural as gravity." I first encountered Blake's poem, Infant Joy, over a decade ago when I read Vaughan Williams' songs for the first time with a colleague at the Marlboro Music Fesitval, and to be honest, at that first reading the beauty of it was lost on me. I merely took it quite literally and assumed it a simple depiction of a newborn infant. After recently reconsidering it in the context of Hannah Gadsby's speech above, the preciousness of this literary image was suddenly heartbreakingly apparent to me. Much like Hannah Gadsby describes, internalized homophobia is something I have had to grapple with my entire life. Even despite having been out for nearly the last quarter century, since I was a teenager. I believe it is something that all of us in the LGBT community wrestle with in one way or another our entire lives. From day one, we realize that we are not normal. And we internalize the world's negativity and, in so many cases, outright hostility towards people like us. It's something that affects our ability to sustain healthy long-term relationships and to enjoy life, liberty and the pursuit of happiness. We carry the burden of this shame in one way or another our entire lives, because on some level, we are taught that we aren't worthy of being happy, we are not worthy of pleasure - because we are sinful abominations that should be turned into pillars of salt. Regardless of how successful we are at overcoming that shame - through coming out of the closet, through pride, etc. - some version of it is always there, lurking somewhere deep beneath the surface. Hearing Hannah Gadsby's words for the first time, I felt like she was speaking my truth. Her words also helped me understand just how precious and valuable the joy of infancy that Blake describes in his poem is. It is the most free and precious time of life, because one only knows joy and wonder. Those seeds of shame haven't been planted yet. Now, listening to Vaughan Williams' setting of this poem, the joyfully arching lines of the oboe and voice that intertwine with each other sound even happier and more glorious. I understand in a new way why they feel so weightless as they soar. This is the time when we are most connected with the Divine, most connected with Love, because we are not weighed down by the shackles of our shame and self-hatred. We, the operatic community, received truly horrible news this week. And before I go any further, please let me make one thing absolutely crystal clear: this post is not about the accused nor the accuser. It is not about anything that has been alleged, nor is it about what may be true and what may be untrue. This is a call for decency. As artists, as opera singers, and as opera lovers, I think we pride ourselves on our ability to empathize. It’s one of the greatest privileges of our artform: when we get to experience an opera, we get to walk in another person’s shoes for a while and see the world from their perspective. I think this is part of why we are generally such a compassionate bunch. I think it’s why anti-bullying campaigns find such easy resonance with us. Each year, I love seeing countless colleagues turn their profile pictures purple for #SpiritDay and put rainbow filters over their pictures for Pride. I love seeing how many colleagues assert that Black Lives Matter every time the world needs the reminder (which is still all-too-frequent). I love seeing how staunchly supportive we all are of the #MeToo movement. We are a community that stands up for the down-trodden and oppressed. The vitriol that unfolded (and perhaps continues to unfold) online, particularly on Facebook the day the news broke disturbs me and is what prompts me to write this post. Reading the comment threads was a shocking thing to see – almost more shocking than the news itself. What started as people trying to defend and support those that they love (both the alleged perpetrator and the accuser) turned into a vile, name-calling troll-fest. Horrible insults littered with disgustingly foul language were lobbied like machine gun artillery, and it devolved almost instantly into the social media equivalent of a shouting match in which very little was accomplished aside from maximizing the pain of these events for everyone on all sides. Just because it comes from a desire to defend, this kind of insult-throwing isn’t any different than bullying. When we engage in this behavior and this kind of dialogue, we are no different than the people we blame for creating the binary and divided state of affairs in which we find ourselves. We are not part of the solution, we are part of the problem. We fancy ourselves better than this – I know we do. The incessant conversation about all of our liberal causes and the constant lamenting about the sharply divided state of the world tells me this. But this week showed me that we are absolutely not better than this. This is who we are, and it’s no wonder we find ourselves in this mess of a cultural and political climate. I’ve never been so ashamed and embarrassed to be part of a community as I have been since Wednesday. Not because of what was alleged in the New York Daily News – because of how we treated each other in the wake of that horrible and tragic news. I know that allegations of this nature bring anger and grief – for everyone on all sides of the matter. But we need to be the adults in the room in times like these. We need to learn to channel our anger and grief in healthier and less hurtful ways. We need to learn to sit with our feelings, and to take a breath before we speak or type. Words are powerful. As opera singers and opera lovers, we know this the best of all, because words are what we combine our beautiful voices with in order to move people to laugh, to cry, and to be consoled. If we know this so well, we should remember their power when we get on social media. There is an adage that one should think before one speaks, because what is said cannot be unsaid. There is another adage that declares that the internet is forever. Please keep this in mind before deciding to spew hateful speech on Facebook – even if it is to defend and support the ones we love. There are better, more effective and classier ways to do that than bullying. If we want a better America, a better world – that change needs to start with us. Me and Rosemary Russell backstage at my professional debut singing Iopas in Berlioz' Les Troyens with the Chicago Symphony in 2002. I often tell people that the only real reason I sing is because it is that was the only way I could make a living as a professional musician. My initial dream was to be a member of the Chicago Symphony's second violin section (I loved playing inner voices), but when I began exploring singing after having been bit by the drama bug as a high schooler, it became clear that this was my calling. When I began to study singing seriously as a 15 year old, I had already been studying the violin for 11 years. As a result, I had a good ear and was able to learn music quickly if I could hear it enough times before a lesson with the woman who would be my primary voice teacher from my final years in high school through the end of my undergraduate studies: Rosemary Russell. Rosemary was aware of my musical training as a string player, and quickly seized upon my voracious appetite for music by assigning me a variety of art songs. Since I had studied French, most of my assignments were either English songs (because it's my native languange) or French mélodies by composers like Fauré and Chausson. The other music I was devouring as a violinist in youth orchestra were things like Tchaikovsky's 6th symphony, Elgar's Enigma Variations, Brahms' symphonies, and Mahler's 5th symphony. The very first German art song Rosemary assigned me was Schubert's An die Musik. After the angsty complexity of the German, British and Russian romantics that I had been passionately sawing away at in youth orchestra, the simplicity of Schubert's two verses in D major was lost on me. On top of having never studied German, I also was still approaching songs from a purely musical perspective. I was less concerned about what they meant, and just reveling in their musical beauty. As a result, I thought the song was simplistic and boring...and therefore arrived at my next lesson not really know it at all. After warming up a bit, Rosemary wanted us to look at the Schubert, and it became very evident very quickly that I did not know the song. After a minute, she closed the lid to the keyboard, and she turned to me and said: "You know, next year you will be a freshman in my voice studio here at UM. You have to know that if you show up this ill-prepared at any point next year, I will excuse you from the lesson and ask you to come back the following week when you have learned your music." Completely terrified that had committed an unforgivable sin, I apologized and blurted out that part of the reason I didn't learn the song well was that I simply wasn't sure that I liked it and couldn't find any recordings of the song that I really wanted to listen to. Rosemary looked at me when I said that I wasn't sure I liked the song, inhaled to say something, and then decided against it. Instead, she said, "You shouldn't be learning music from recordings. And while I know you know how to learn music as a violinist, you need to know how to learn music as a singer, which is a very different process." She then proceeded to spend the rest of the hour using Schubert's ode to the power of music as a means to show me how to teach music to myself. It was the most valuable voice lesson I have ever had in my nearly 25 years of study since then: The principles I learned that afternoon in her studio are the bedrock of quite literally anything and everything I do musically. Every time I am asked to sing this song in performance, my mind always drifts back to this little vignette from my adolescence, and the great gift that this particular song (of all songs! ), turned out to be. Rosemary passed away in 2005, and I miss her terribly. I was so fortunate to have spent those formative years with her. This song is one of a couple that always make me think of her and the many gifts she gave me that have served me so well over the years, unlocking music's power. The fantastic folks at A Far Cry have posted a clip from our January concert of British music as their Flashback Friday contribution this week. The clip is our set of numbers by Henry Purcell, Matthew Locke and Nicholas Lanier which opened the program in Boston at the beginning of the year. Thinking back on that week with the Criers, it was truly a high point of the first half of this year. It was a real privilege to collaborate with such serious and dedicated musicians who approach music with such innovation and joy. No note was taken for granted all week, and expression was always at the forefront of what we were aiming for. Hope you enjoy this little trip down memory lane. In general, as one gets older, it gets more and more difficult to find true mentors - something that is so important for any artist's continued growth. As classical musicians, we are lucky that our art form still has its elder statesmen: the conductors who keep trekking along, waving their arms and guiding musicians through masterpiece after masterpiece, week to week. I've been incredibly fortunate to work with many of the greatest our field has to offer over the years, and one of the most generous and challenging that I have encountered has been Helmuth Rilling, who celebrates his 85th birthday today. I met Helmuth under some rather extreme and incredible circumstances on Valentine's Day of 2009, when I jumped in on a few hours' notice to perform Haydn's Creation with him and the Orchestra of St. Luke's at Carnegie Hall (you can read about that surreal experience in an old blog post, here). Since that fateful day, Helmuth has been an unbelievably generous and supportive mentor - offering me many fantastic and transformative opportunities over the years. Over the past 9 years since we met, I've toured with him everywhere from the Kennedy Center to the German churches in which Bach worked and premiered his masterpieces hundreds of years ago. Among the most rewarding experiences I've had making music with him, my summers with him at both the Oregon Bach Festival and his recently-founded Weimar Bach Cantata Academy, have been extra special. In both of these places, we have had the luxury of time. Those summer weeks with him have proven to be invaluable, in which he has unlocked so many of the multiple layers of Bach's music for me in ways that feel luxurious in these fast-paced days of professional concert life. My perception of Bach's music and the importance of his work has been forever changed because of my time with Helmuth, and I always treasure every moment I get to work with him on these incredible masterworks. I find that the greatest musicians are the ones who never lose their sense of wonder at what incredible beauty these composers have created. It is so inspiring that despite having lived with Bach's music for so many decades, Helmuth has never lost his sense of wonder and respect for these masterful compositions, and that he even continues to find new things in this music as the years pass. For him, the answers are always to be found in the score, and in what the composers demand of us musicians through the notes they have written down on the page. To experience Helmuth's discipline and insight and to be perpetually challenged by him to do the best work possible has been and continues to be a privilege. The happiest of birthdays to you, dear Helmuth. It is an honor to be a part of the incredible musical family that you have brought together worldwide. Thank you for all you have given and continue to give the world through your work! Roughly four years ago, shortly after I had made the move West to San Francisco, I received a call from my manager with an inquiry from San Francisco Performances, who were wondering if I might be interested in taking over as their vocal artist-in-residence. While SF Performances had no idea that I had just moved from Manhattan to the Castro, they had unwittingly given me what was part of the most wonderful welcome to my new home in the Bay. One of the primary concerns I had about leaving New York City was my ability to work at home. One of the great joys of my musical life during the course of the 8-9 years that I lived in New York City was that I was able to work at home with a fair amount of frequency. The invitation from SF Performances was a welcome sign that San Francisco would hold the same privilege. Between my work with SF Performances, the San Francisco Symphony, Philharmonia Baroque and the many other institutions and musical colleagues with whom I collaborate here in the Bay, I must say that I have never felt more welcomed by a musical community. My musical life and circle of musical friends and colleagues here is one of the primary reasons why I have fallen so madly in love with this city and am so proud to call it home. These past four years with SF Performances have been a fun adventure, and tonight's recital at the Herbst is a milestone of this residency. As the vocal artist-in-residence, SF Performances tasked me with building awareness in the Bay Area of the relationship between music and text, and the art of the vocal recital. Through this residency, we have organized classes and interactive sessions on exploring what art song is and discussing how composers reflect text in their music with all sorts of groups, including high school and middle school students, university and post-grad students, as well as the general adult audience through salon concerts and community events. I've also had the chance to mentor young singing musicians throughout the Bay Area, in a variety of levels ranging from advanced students at SF State University to the bright young women of the San Francisco Girl's Chorus and the ambitious young singers of the Bay Area Vocal Academy, and many more Bay Area music education institutions. Watching so many pairs of eyes light up upon realizing the connections between text and music and seeing the relevance of this timelessly important material to our lives today has been one of the most rewarding experiences of my life in music. Cajoling listeners of all ages to give themselves permission to hear the words and music and have the courage to engage with an art form that has the illusion of being only for those who already know about it has taught me that this music really can be for everyone, and that it is up to us, the standard-bearers of this art form, to continue to ensure that people are exposed to it and encourage people to engage with it. In a day in which generations of the general public have been deprived of basic music educations, due to these programs being cut in schools over the past decades, the work of the SF Performances Residency is all the more important to the art form's continued survival and growth. Tonight, there will be so much to celebrate. There is the work of these French geniuses of 100 years ago, there is the joyous work of this residency, and there is (of course) also the release of Illuminations, which comes out next week. But beyond all of this, I'll also be celebrating the deeper reasons behind doing all of this: To continue to bring more and more people into the fold, encouraging people to keep loving music, words, and the places where they so beautifully intersect. Considering how much very loud opining there has been lately amongst the Classical music community about the dearth of diversity in programming, I must admit that I am extraordinarily surprised that so few people have mentioned Lili Boulanger. March 15, 2018 was the 100th anniversary of her death, and I would have thought that more people would be writing about her in this age in which article after article is being published decrying how few female composers are being programmed enough by our leading classical music institutions. This article about the Cleveland Orchestra basically went the classical-music equivalent of viral a couple of weeks ago, just days after the anniversary of Lili's passing. I saw it posted on countless colleagues' social media accounts - yet I've seen little-to-no mention of Lili Boulanger. In an industry that is obsessed with celebrating anniversaries, it is shocking that the centenary of her death barely registers on the radar. Leonard Bernstein's 100th birthday is all over the news, and I can't tell you how many times I've heard presenters already excitedly mention Beethoven's upcoming 250th birthday in 2020 in artistic planning discussions, yet a Google News search of Lili Boulanger's name reveals little more in the English-speaking musical press than a cursory post about the centenary of her death on Slipped Disc that doesn't elaborate much on its headline beyond a link to an older post about Lili and a youtube video of her Nocturne for violin and piano. I don't compare press mentions to imply that composers like Bernstein and Beethoven shouldn't be fêted, because they are white, male composers or because they are so often performed as part of the standard repertoire. On the contrary, I strongly believe that their work should be celebrated, and that there is every reason to take advantage of these anniversaries to do so. Considering how many major symphony orchestras have 52-week seasons, there is more than enough opportunity to celebrate them as we are, and to celebrate the work and tragically short life of Lili, as well as the work of other under-performed female composers and composers of color. Looking forward to Tomorrow's recital at the Herbst Theater here in San Francisco, Lili's music takes the prime spot on our program. My recital partner, Myra, and I will perform 8 of the 13 songs from Lili's song cycle, Clairières dans le ciel. Since the cycle is so long in its complete form, it was only possible to perform parts of it for this program. As she herself excerpted 8 of the songs to be orchestrated, I took that as a clue that it would be appropriate to perform these 8 songs of the cycle on their own (Myra and I are planning on performing and recording the cycle in its entirety in a future season). Despite the fact that we will perform only excerpts of the cycle tomorrow, it will be the longest set we perform that evening, as well as the most musically and vocally demanding. I previewed the final song of the cycle, Demain fera un an, at a Community Music Center concert this past Friday, and the audience was astonished at how forward-sounding and large-in-scale her one song was in comparison to the other songs written by her male colleagues and teachers that we performed that afternoon. While there were other female composers during the time of Lili's life, Lili stands apart as a trailblazer, which is remarkable considering that she died at the young age of 24. At just 19 years old, she was the first woman to win the prestigious Prix du Rome in 1913, ten years after the ban on female contestants was lifted. The Prix du Rome was an important competition that launched the careers of many a famous French composer, including those of Debussy, Massenet, Bizet and Gounod. During the years of the Belle époque, female composers were mostly only permitted to write simple parlor music and most often eventually assumed roles as music teachers (such as Lili's hugely influential sister, Nadia) or stopped composing altogether after marriage (like Alma Mahler, who's only surviving compositions are roughly 15 art songs which were composed before her marriage to Gustav). The lifting of the ban on female competitors opened the door for women to begin pursuing careers as serious composers who would write larger scale works. Lili did this upon her historic victory, and she did so with a compositional voice that was distinctive, sophisticated and boundary-pushing. Had she lived longer, one wonders where her pioneering vision might have taken music history over the course of last century. Both Myra and I have fallen in love with Lili's songs as we have prepared this new program, and we can't wait to dive further into her music in the coming seasons. Lili's music is important, beautiful and transfixing - one doesn't need the excuse of an anniversary to program it. It should be performed all the time and on any occasion - just like we perform Bernstein and Beethoven whenever we wish. Nonetheless, it is a wonderful thing that we will get to fête her tomorrow night at the Herbst during this centenary year of her death. If you're in the Bay Area, we hope to see you there.